When you are a guest in someone’s home, you try to be respectful. When you’re in the distinguished James Beard’s House, you are very respectful. It was nearly 7 p.m. and we were led into a plain brownstone with a simple plaque at the entrance stating it was the James Beard House. James Beard was the catalyst for showing people how to cook American food at a time when TV dinners were all the rage. In 1946, he had the first cooking show on NBC. Never one to sit still with so much culinary knowledge to share, his prolific cookbooks and magazine articles dominated the cooking world from the 1940’s until his death in 1985. His word about cooking with locally grown fresh foods was regarded as gospel and people wanted to hear and read the truth about cooking. And still do to this day. My early recollection about him was reading his writings in well-known food publications and daydreaming about preparing and eating the foods he knew well. At the time, I was doing my best to move beyond TV dinners and box mixes. 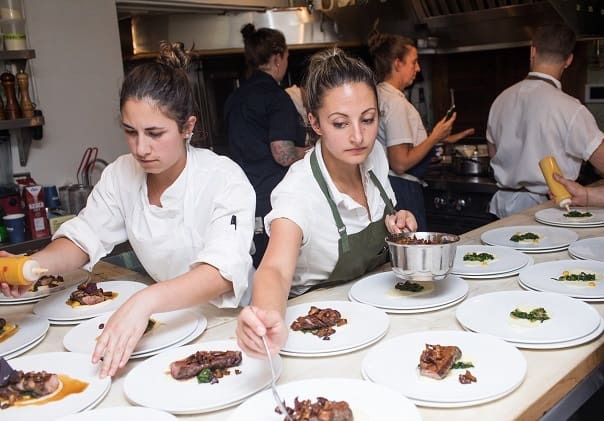 James Beard hosted cooking soirees complete with elegant entertaining in his Greenwich Village house and many famous people from the culinary world graced the kitchen. But, he also reached out to all levels of cooks by establishing cooking schools which operated for thirty years. His prominence carried on after his death when notable chefs such as Julia Child ensured his home became a living institution in his honor. The James Beard Foundation began, and his home lived on to be a vital centerpiece. The Foundation’s mission has remained the same, to honor and celebrate chefs and highlight America’s food culture for everyone. 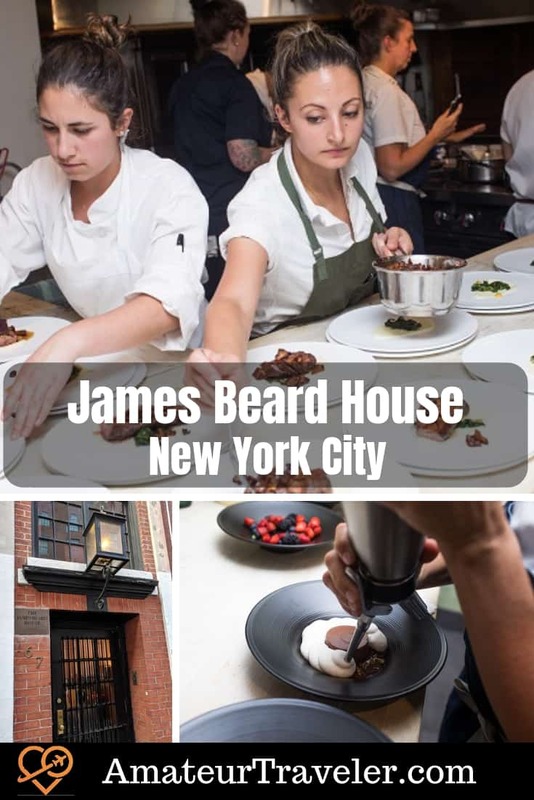 Chefs are invited to “perform” at the Beard House and the criteria for an invitation is secured by set guidelines one can find on the Foundation’s website. Chefs who are invited, are established in their culinary fields and well equipped to handle this extraordinary cooking venue. It is not for the lighthearted, but the experience gained is great. And the list of chefs hoping to be invited is long. Many know of the coveted James Beard Awards which is a prestigious award bestowed on winners from categories such as restaurants, chefs, cookbooks, journalism and many other categories. The awards are separate from the invitation to cook at the Beard House. (The James Beard Awards are commonly referred to as the Oscars of the cooking world.). Like clockwork, we were ushered through the living room and stepped into the kitchen. The kitchen was surprisingly small and numerous chefs moved around hot stoves, steaming pots and prep counters like a well-oiled machine. The chefs appeared unfazed with the demands of the dinner and politely acknowledged the 50 incoming diners. We were asked to go to the outdoor garden patio, where it was a pleasant August evening. Before dinner, spritz choices of strawberry Amaro and spumante were generously poured into flute glasses. As I sipped the refreshing drink, my food tastings began. Trays of Hors d’Oeuvre were gracefully brought to each person throughout the reception time. My memorable choices were smoked short rib tartare on marble rye bread and Chicharron style tomato and smoked trout roe. A gentle nudging and it was time to walk up a small staircase where we were seated at assigned tables. A portrait of James Beard hung over the fireplace and on each side book cases with his library. Tables and chairs filled the small rooms with draped white tablecloths and what used to be his step-up bedroom had a table for 4. Conversations began among the eager diners as they introduced one another and within minutes, dinner was coming out of the kitchen. Service of each course was delivered with timely precision and I glanced at my printed menu to fully appreciate the sensory awakening from the plated foods. 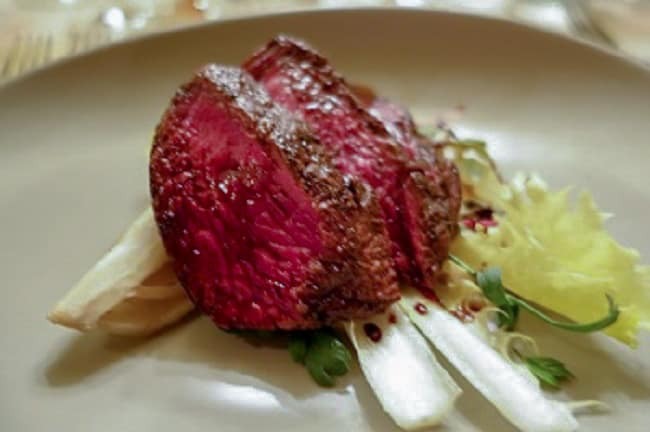 The complete menu was prepared by various chefs who work in local New York City restaurants. I’ve eaten in fine dining restaurants, and food of this caliber at the listed price is a deal. Buffalo milk caramelle with black sesame and brown butter, glazed duck, New Zealand venison loin and dark chocolate budino with cardamaro crème and espresso sauce for dessert were memorable. Each course was served with different renditions of Amaro liqueur which enhanced the dining experience. Once back home, I reached out to a local pastry chef who has cooked in the James Beard House six times. I wanted to know what it was like from a professional chef’s prospective to cook in this hallowed kitchen. James Foran, a former executive pastry chef and currently instructor and culinary coordinator at Grossmont College, said the experience in the House was exhausting and fun. Chef Foran told me, he and the other chefs would arrive early in the morning the day of the meal and start prepping and make sure each item was ready. He remembered needing to be very organized and if a critical ingredient was missing, he’d run out to the Manhattan streets and buy it. 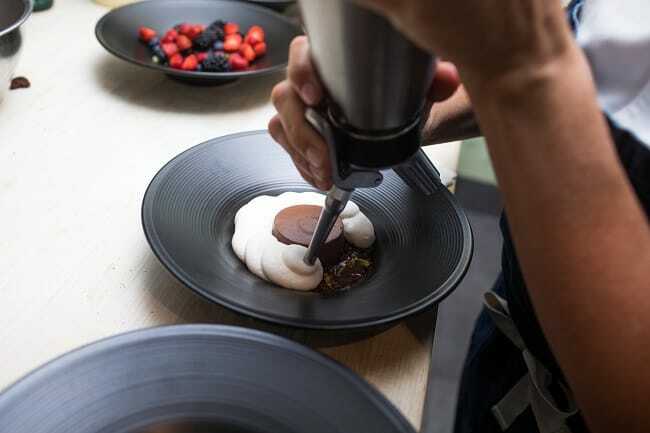 Chef said it can be exhilarating with little sleep because of travelling, hard work in the kitchen and wanting his part of the meal to look and taste flawless. Afterward in the late evening, it was time to relax and relish the accomplishment of cooking in the celebrated kitchen. James Beard events are held in many locations across the US and more information can be found at www.jamesbeard.org. Whether you attend a dining event in New York, Denver or Los Angeles, it will be a slice of history served in a delicious style. Now, this a food traveler’s paradise adventure. 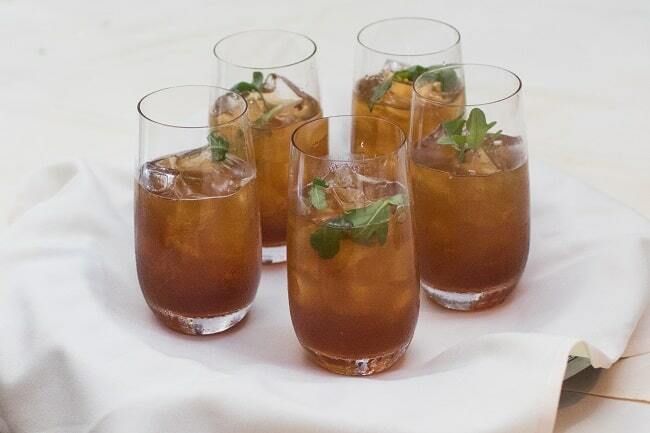 Some photos by Jeffrey Gurwin, courtesy of the James Beard Foundation. Photos are from the “Amaro: A Bittersweet Love Story” dinner at the James Beard House.